We’ve had one new addition into the Top 25, meanwhile, the majority of the rankings remain unchanged from last week due to the exam period. One thing is for certain though as most leagues begin to progress into regionals and playoffs, we will have a very clear picture of who is considered some of the top talent in Canada in the coming weeks! Orangeville had the week off after reclaiming the number one spot in the country last week. They will be competing this weekend in the National Prep Invitational in Rhode Island this coming weekend. They will kick off their schedule this morning at 10:30 am EST against #5 nationally ranked Brewster Academy according to Prep Circuit. CTA is off for exams, but will be returning to action this weekend in Rhode Island for the National Prep Invitational. Their first game will be a true test against Aspire Academy out of Kentucky on Saturday, who in fact manged to defeat Orangeville Prep 82-77 back at the Mustang Madness earlier this month. Their second matchup will be the following day against #7 nationally ranked New Hampton according to Prep Circuit. Needless to say, this could be the most important trip for CTA outside of the NPA Nationals in March. FHC is off for exams this week, but will return to action February 5th when they take on Vaughan in a game that could have some big implications for both the top 25 rankings, and for the OSBA playoff picture. Look for Josh Morgan and Kobey Lam to continue their impressive scoring in the month of January into February. Beckley Prep out of West Virginia, followed up with a matchup against Redemption Christian Prep from New York. They will then have a huge road game against FHC where they will attempt to sweep the season series against the Crusaders, after defeating them 112-103 earlier in the season. Crestwood nearly made history yesterday, nearly becoming the first Canadian prep program to defeat Oak Hill Academy at the Big Atlantic Classic. Despite the loss, it still remains as the best performance for a Canadian school against the prestigious prep academy, and is more than enough justification for Crestwood to hold on to their 5 spot in the country. Crestwood is back in action today against Beckley Prep at the Big Atlantic. Ridley handled business on the road against Bill Crothers in league action. Jaden Bediako led all scores with 26, while Anthony Duadu finished with 14. Ridley is now off to the NPI in Rhode Island, where they will take on BK Rig out of Sweden at noon today, and Beckley Prep tomorrow at noon as well. RISE had the week off due to exams, and will be back in action February 6th for a league game against Ridley College. TRC Academy improved to 11-3 in league play after beating A.I. Red. Darius DeAveiro had 16 in the win, along with 15 from Avan Nava. The Wolfpack will now be in Rhode Island for the NPI this weekend to take on BK Rig out of Sweden, and Aspire Academy out of Kentucky on Sunday. Vaughan is off for exams and will be back in action against FHC on February 5th. The Voyageurs are playing their best basketball of the season at this time, and will be looking to get back above .500 in league play while challenging for a playoff spot to close out the season. Rothesay was off this week due to exams and will be out of action until February 12th, when they will celebrating their senior night against Simonds High School in a local matchup. After that, RNS will head to Montreal on the 22-23 of February where they will face Saint Laurent and CTA. Southwest had the week off for exams, they will return to action February 5th against a Central Tech team that has seemed to find their competitive edge once again. King’s Christian is enjoying an extended break for exams, and will be back in action on February 5th in a big test against TRC Academy. The Cavaliers are 1-3 in their last four, but given just how impressive this team can be at times, it is not that hard to imagine seeing them make a surprise run should they stay in contention for the postseason. 2019 6'7 Wing – Amir Gholidzadeh recieves Player of the Game Honors after scoring 22 Pts and 9 Rebs in a 90-68 Win Vs @OakvillePrep at the @ChetMason32 @TheCMI2019! TBA managed a convincing 90-68 win over Oakville Prep at the Chet Mason Invitational this past weekend. Amir Golizadeh was named MVP for TBA, while Sami Jahan managed to be a factor in all facets of the game, forcing turnovers and knocking down some big shots that allowed TBA to pull away for good. While the junior squad managed to get a couple wins at the National Junior Circuit earlier this month, the Varsity squad remains off until the NPA Western Session in early February. Edge School remains off until February 7-11 where they will be hosting the NPA Western Session. Look for Fofo Adetogun and the rest of the Edge School to bounce back onto the national scene following the session. GTA Prep has the week off in preparation for the NPA Western Session in February. Central Tech had an exam break this past week but will be back in action February 5th against Southwest Academy. Another chance for the Blues to move up the rankings will be their host tournament Feb 8-9 followed by a matchup against Orangeville Prep on the 11th. London had the week off, and will return to action on February 8th in Calgary as they participate in the NPA Western Session. It will be interesting to see how LBA will build on such a big win over Oliviet College the week before, and if they can become the dark horse for an NPA title based on the depth of their roster when healthy. Pine Ridge had one of their LOSSAA games rescheduled due to weather conditions this past week, and as a result still have four games remaining in their regular season. In that time, expect Marcus Moore and the rest of the Pumas to continue to prove why they are the odds on favourite to repeat as OFSSA champs. D1 🚨Congratulations to @tylersagl on his commitment to @maristmbb !! No games for Lincoln this week but off of the court they received some great news, as leading scorer Tyler Sagl committed to NCAA Division 1 Marist College out of Poughkeepsie, New York. The Huskies will be taking on Bill Crothers on February 1st. SBA is currently in exam period, and is gearing up for the NPA Western Session in Calgary. Expect Aliou Sesay and the rest of this first year program geared up and ready to continue turning heads after a month of preparation. St. Laurent is off until February where they will be in the NPA Western Session. Until then, 6’8 Arnaud Ngamije has returned to practice, giving the Express a much needed boost in size that can make them very dangerous in the final months of the season. Junior Mercy has also managed to make a case as one of the guards that will be selected for the Quebec U17’s team this year. Finally, Roosevelt Auguste has been stretching out his shot to make himself a dangerous 3 point shot on top of his already impressive awareness from the high post and wings. If St. Laurent can stay healthy, don’t be surprised if you see the youngest team on this list shock the country come NPA Nationals in March. LaSalle has the week off due to exams, while their next game is scheduled for tilt against Napanee District on February 5th. Following that, LaSalle will be off to the Wayne Nugent CLassic in Vaughan, where they will put their perfect season on the line against none other than Thornlea’s public school squad. With one game remaining in the regular season, they will be taking on regional rival and battle tested St. Mary’s HS on February 4th to try and secure the top seed and a bye in the first round of the playoffs. Look for the 1-2 punch of Ben Mascarenhas and Trent Johnson to show up in the score sheets for this Cambridge squad, as they attempt to claim yet another OFSSA berth in this school’s proud history of basketball. 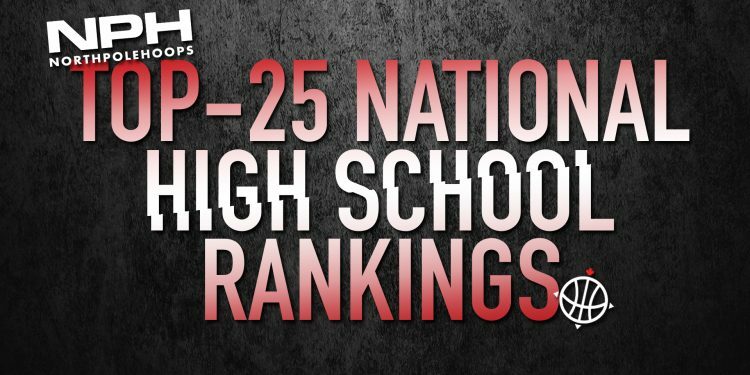 Resurrection out of Kitchener gets their first entrance into the top 25 this year. After an impressive 10-1 season that included multiple wins over regional rival St. Benedict and St. Mary’s, it will be shaping up to be one heck of a playoffs showdown in south central Ontario for the District 8 title with this Kitchener squad in the mix yet again. NPH Platform Underclassmen Rosters Released!